Members of FEMA and SC DNR to discuss impact. As we gather this year, give everyone you love a hug. Be conscious of the memories we’re making. We are so blessed with spectacular big water views, changing leaves inviting crisp fall walks, geese flying by information, herons hunting, and fish jumping. Some families will go hunting in our beautiful woods. Some will dress in camouflage after dinner, and play rounds of paintball. (Yes, we were those rednecks before we aged out! This year we’re hunting for laser tag suits.) Some will stuff themselves and share games and naps. Some will just gaze at the water. Regardless, embrace this holiday. It’s extra special this year for the Jenkins family. Many Brim were hauled in using cane poles and bread balls. A snake showed up once during a swim across the cove to the Thayer’s cow pasture. Let’s just say there was time spent meditating on the other side waiting for a boat to retrieve said person in their briefs. There were Thanksgivings overlooking Lake Greenwood. Children ran through the yards playing and jumping off walls into the lake. When you’re young you don’t feel the cold the same way! Now Lee Rodgers and his wife Mildred are both on the other side. So are the Klaubers along with one of their sons who loved swimming in front of their home. Grown grandchildren now vacation in the homes, soon to introduce yet another generation. Life is fleeting and so precious. This opportunity to gather and reminisce about Lake Greenwood feels nothing short of sacred. You see, Daddy has been diagnosed with a cognitive disorder. This precious man spent his life serving others as a Dentist, just as his father before him. He’s brilliant too. He pioneered techniques to help people with TMJ problems, built his own home on the lake, and grew his own Paulownia Trees to harvest the light wood; which he now crafts into an airplane. This is the same man who kept his head about him as his Cessna went down with all five of us on board, along with the dog. He put the plane right between two tall pines to break the crash. We all walked away. This is a man who stayed true to his wedding vows to the only woman he ever wanted to marry. He hung in there with his three children through thick and thin, naming his first boat KTR after his kids. We waited for the second he could come home from work to pull us on skis. Stormy nights he would sit with us to watch the lighting cross the lake, pointing out the clean smells and beauty of it all. This man is my hero, and now he begins the journey of losing pieces of himself slowly but surely. No one has discussed this with him, so please don’t. This is being shared so that when you sit down with your family, you won’t take Thanksgiving 2017 for granted. You will remember that we’re not promised together forever. Take Thanksgiving this year and make the most of the time together, and the majestic natural beauty we share. You can bet we will be dining lakeside, soaking in every precious moment. Just in time to walk off some turkey! The new walk-bike trail is officially OPEN! 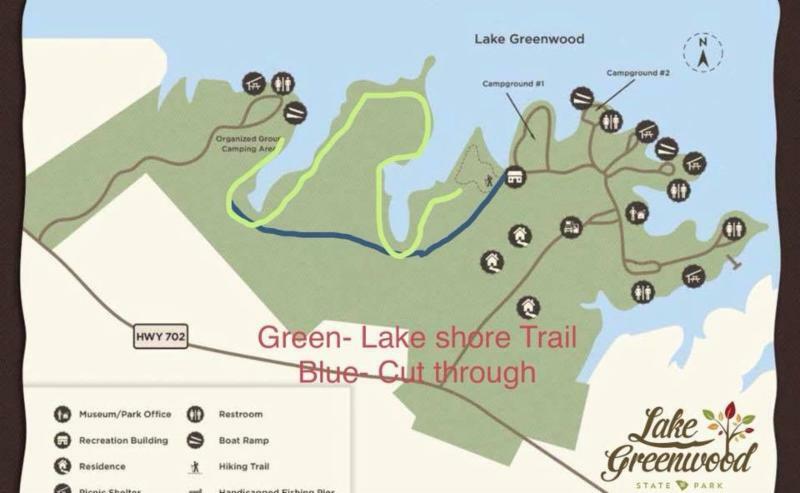 For now, enter the State Park at camp site #1. Your adventure starts behind the picnic shelter. 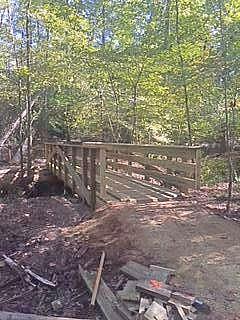 Paths are cleared and bridges are up, but we may still have some wrap up project, so sign up. When we schedule a work day, we will email all for sign up opportunities. and of course Break On The Lake Opens this spring! Together we will continue enhancing our quality of life. Look for more information about our partnership with you in the December newsletter. In the meantime, Happy Thanksgiving to You and Yours!